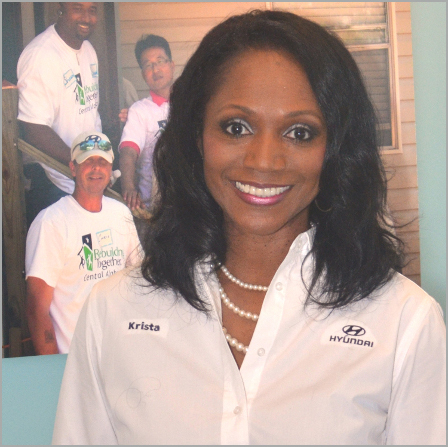 HMMA Team Member: Krista Hawkins | Hyundai Motor Manufacturing Alabama,LLC. Krista Hawkins is a community relations specialist in HMMA’s public relations department. She joined the HMMA team in early 2005 as a contracted HR recruiter, and then became a PR Team Member later that year. Over time, Krista’s responsibilities grew to include the administration of HMMA’s community relations activities. In 2007, she officially became a community relations specialist. “Back then, HMMA had diversity activities separate from community relations activities,” she remembers. “Diversity coordinated activities like Habitat for Humanity while community relations sponsored activities like the Joy to Life Walk for Life. Krista says over the years HMMA’s community relations initiative has grown exponentially and it’s due in no small part to Team Member involvement.